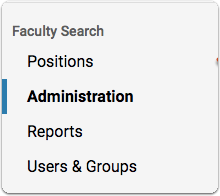 In Faculty Search, all the applications to a given position appear listed on one page. We call this the Applicant List. This article explains how to find the Applicant List and how to access applications. The list of applications for a position is often quite long. We provide you with a number of useful features and organizational tools to help you sort and manage your work on the Applications List. See here for more information on working with the Applicant List. The open and close dates appears at the top right of the page, the position status to the top. Click an applicant's name to view the profile of an individual applicant. Note: The buttons that appear after selecting an application are determined by your role in the program. 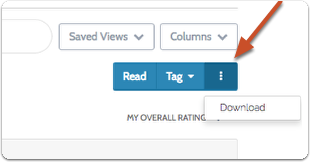 If you are an evaluating committee member, you will likely see "Read" and "Tag" buttons. 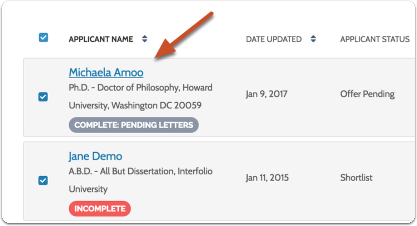 Committee Managers or Administrators may see additional buttons for assigning a status to an application, emailing applicants, etc. Click "Read" to view selected applications in your browser using Interfolio's "Materials Viewer"
See here for more information on using the viewer to read and annotate application materials. 2. Click the "Additional Options" icon and select "Download"
The example below is for downloading materials from the notifications menu, but you can also download these materials through the email you receive, or from your Notifications center. See here for more information on other options for downloading application materials, including downloading all materials for an individual application, and downloading individual application documents one at a time.